perfect summer fashion. The summer blouse you NEED this season. Hello Again all of you amazing readers! How is the beginning of this week treating all of you? I am spending most of my time at the beach/pool side or rocking my favorite summer fashion. I mean, this cute little nautical-ess look was perfect for strolling through Manchester-By-The-Sea and grabbing ice cream with the fam. Mason has been out of school for two weeks and I am already running out of ideas to keep this kid busy! I would love if you could leave me some fun, budget friendly ideas in the comment section. This summer blouse has stripes, peplum, and eyelets, so ya know, I am pretty much in love with it! The fact that it isn’t OTS says something… doesn’t it! Summer fashion is one of my favorite seasons to dress for. Well, then again I say that about every season. I debated wearing this summer blouse with denim shorts or these white pants. I went with the white because there was a chill, however, both looked great! So, lets jump into white denim. You need a go-to, can’t live without, fits like a charm, pair of white denim for any complete summer wardrobe. Summer fashion is all about those whites. This summer blouse is under $40, so you might just do yourself a favor and grab it now because it goes with everything. I mean this look is kind of nautical, super feminine, and full of all the seaside feels! I know if your anything like me, you love a great steal! This target find costs less than a weeks worth of starbucks, and is a pretty awesome dupe for the chanel bag that I love, but certainly can’t afford! We are currently building our new home, so unfortunatly, designer bags and unnecessary purchases are out of the question at the moment. It’s way harder than I thought it would be, but the end result will be so worth it. These DiFFeyewear glasses were sent to me, and I have been loving them. Diff is such an amazing brand and you can recieve 25% off your order with my code: GRETCHENDIFF. I don’t know about you, but I change my sunnies up with my look, so I need a lot of pairs! Diff has so many colors and styles so it’s always easy to find a pair… or ten that you love! This summer blouse from Chicwish is perfect for those chilly summer nights. Believe me when I say all the summer fashion trends are giving me some major love vibes. 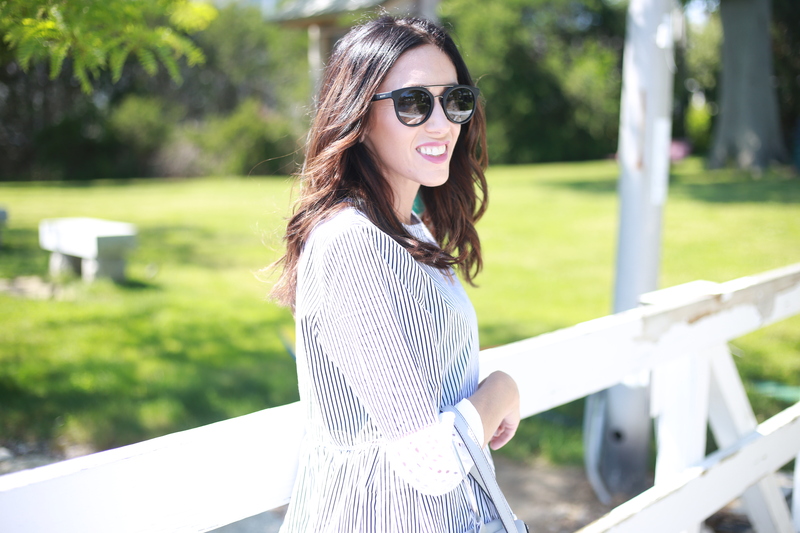 If you are loving gingham, don’t forget to check out the Giddy for Gingham post! So what summer fashion trends are you currently obsessing over? Let me know in the comments! Thanks for reading, and I would LOVE to hear your thoughts in the comment section below! Shop my look by clicking on the item.